My Second Life as Amariah Francis: New Release! 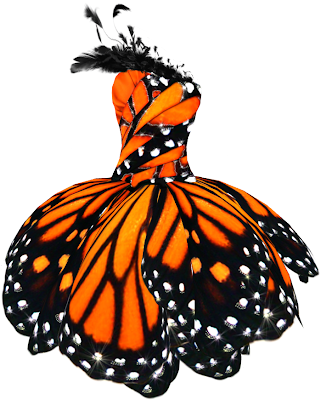 Monarch Butterfly Dress! Hand drawn textures! New Release! Monarch Butterfly Dress! Hand drawn textures! This is my newest release, the Monarch Butterfly Dress. This dress is simply stunning, I got several comments walking around in this dress before it was released. The textures on this dress are hand drawn, rhinestones sparkle against the recognizable monarch butterfly pattern. Here's a closer look! This dress is a "MUST SEE" it looks much better when on than any of the images can capture! As some have noticed, this dress is influenced by Luly Wang. I do want to repeat that no images were stolen in the creation of this dress, they are all hand drawn down to the small little rhinestone dots. Furthermore, I'm not the only person to have been inspired by this lovely RL design, Vindi Vindaloo was as well. I think that both SL versions are beautiful as obviously so is the RL version. My version is different in the length, cut, back-side, feather type, and pattern; this is a derivative version and nothing more. Wow, what a fab idea for a dress! i know this may be an old post i've been eye balling this for months, is there absolutely ANY way i could purchase this dress? i'm seriously interested! Hello-- I also tried the link. I absolutely love that dress--- would I be able to purchase? Is this dress or pattern available for sale? i was wondering where you got the monarch butterfly fabric to make this? I would like to but this dress but I can get the link to work! I want this in REAL LIFE not for some game.... where can I get it? can someone tell me how much it is? This is a virtual dress for Second Life it's not a real dress. I am honored that so many people are using my image on Polyvore for creative mashups. :) But you can't buy it in real life, it's not real fabric, and the textures are hand drawn in Photoshop. Luly Wang is the designer that made the original dress that this virtual dress is inspired by. When I checked the dress was a one of a kind and several thousands of dollars.